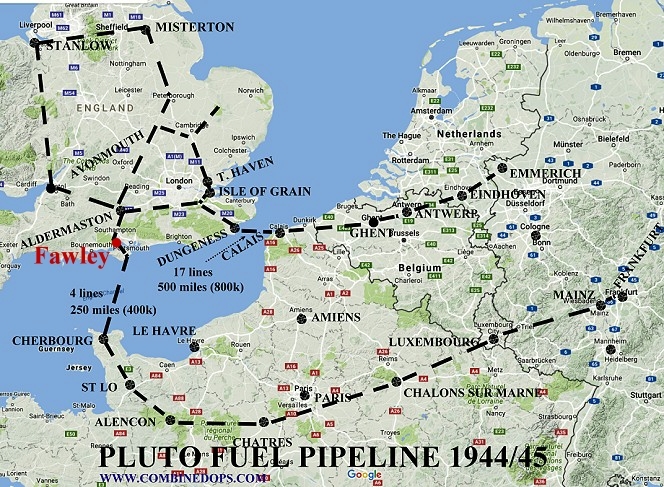 PLUTO, the WW2 Pipe Line Under The Ocean, had a sizeable network of storage tanks, pumping stations and pipelines in southern England to ensure an adequate supply of fuel could be pumped to the Allied armies as they advanced across occupied mainland Europe and into Germany. There were many essential elements to the successful outcome of the war on the western front, but none was more critical than the supply of fuel. This is an account of one tiny part of that network as remembered by a local resident, then a young boy. David Ride grew up in Fawley, Hampshire, during the war years and beyond. It was then a small rural community within easy walking distance of Southampton Water along relatively quiet country roads. Today it's a bustling town of 15,000 with the largest oil refinery in the UK on its doorstep. The origins of the refining industry in Fawley were much more modest when, in 1921, the AGWI (Atlantic Gulf and West Indies Petroleum Company) was established. In 1926 it was taken over by a larger operator and has seen numerous expansions since then. During the war there were real concerns amongst the locals that the Germans would bomb the refinery. It was a legitimate target for their bombers but the only damage sustained was to the chancel of an ancient local church, courtesy of the Italians. These are David's childhood recollections of those times in general and the PLUTO storage tanks, pipelines and pumping station in particular. Being close to one of the major embarkation points on the south coast of England, Fawley and its surrounding areas witnessed the transit of troops and their military equipment. It was quite an exciting time for the children in the area, who had little understanding of the reality of war. In those days David lived near the middle of Long Copse, between The Kennels at Holbury and Rollestone Crossroads, in a bungalow then called Merryoak. He recalls that American troops were camped along Long Copse Road for a couple of weeks before D-Day. Their living conditions were primitive and many slept under their vehicles, where they were parked. To ease their discomfort his mother opened up her garage, which soon metamorphosed into a clubhouse, where they played cards, smoked Camel cigarettes and read their ‘American comics’ which, curiously, had an unfamiliar, characteristic smell. Suddenly, they were gone and everyone knew D-Day had finally come. In the weeks ahead, British troops were followed by more Americans, each taking their places in the embarkation queue for nearby Lepe Beach. Later, yellow boxes were painted on the road to define parking places for individual vehicles such as tanks and half-tracks. One unit, comprised entirely of black American troops with white officers in charge, stood out from all the others. In those days institutional racism was rife and these troops were considered unfit for combat roles, so were assigned to support and engineering duties. They were a great source of interest to the children, most of whom had never seen a black man before. The men were friendly and cheerful and much liked by the local community but, like all who had proceeded them, they were gone within a week, leaving little evidence that they had ever existed. Lepe Beach was not just an embarkation point for the invasion force. It also had the distinction of being the site where six B2 breakwater, Phoenix, Mulberry Harbour caissons were constructed. The remains of the 400 metres long platform and rail-tracks are clearly visible today. Two of the caissons, for whatever reasons, were not used, since they were moored well off the beach at Calshot for a long while after the war. Knowing how meticulous was the planning for Operation Neptune (the amphibious phase of Operation Overlord) and Operation Overlord itself, it would be unsurprising if these were spares! 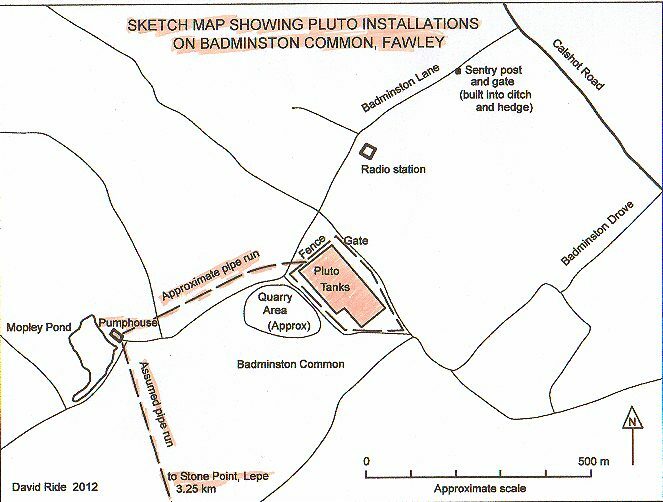 There were many wartime installations in the area, including the storage tanks used for the Pluto project. They were located at the end of Badminston Lane just off the Fawley to Calshot Road in an area generally known as The Common. It was largely open heath-land, much like the New Forest, covered with heather and gorse. The soil in the area was a mixture of sand and gravel, which has, in more recent times, led to extraction on a grand scale. Half way along Badminston Lane, on the south side, was a small sentry post constructed of filled sandbags. There was also a gate made of girders and barbed wire that could cordon off the road if necessary. Similar gates were erected at three places along Copthorne Lane in Fawley, presumably to shut off access to the Refinery. These positions would not have provided a strong defence against even a light mechanised assault but the sentries were no doubt in telephone or radio contact with a local command and control centre. At the end of Badminston Lane, on the left, was a moderately sized red brick and slate building with aerial masts nearby, suggesting it may have been a relay or radio station, The down lead from the aerial array entered the building though a huge pane of yellow glass set high up in the wall. Its purpose is unknown but it may have been used for communications by the nearby RAF Calshot or some local command and control centre. It was turned into a primary school after the war and is now (2012) a car breakers business. There were wooden hutments in the field to the east of it, most likely for accommodation or stores. The Pluto tanks were located beyond this brick building. The tanks measured about 180 metres by 100 metres and stood about three or four metres high. They were covered over with soil and sand taken from an adjacent area to the SW of the tank compound and then grassed over to conceal their position and purpose. The removal of the sand and gravel left a huge scar on the landscape about a metre deep and required to be camouflaged. This was achieved by lopping off the top 2 metres of pine trees, positioning them in the manner of plantation trees and securing them in position with wooden pegs and galvanised iron wire. They soon became a local feature as a forest of small dead tree tops! The tanks were housed in a lozenge shaped compound about 280 metres by 170 metres, surrounded by a high green fence made of creased iron strips with the tops splayed out to form a trident of spikes. A small concrete building stood inside the gate, with pipe connections similar to those used by tanker lorries. The beginning of the PLUTO pipeline ran some 500 metres to the WSW from the compound to the pump at the eastern edge of Mopley Pond. Mopley Pond was formed in the mists of time by damming the valley, where two streams met. A course of four-inch glazed earthenware sewer pipes, mostly laid on the surface, ran from the direction of the tanks towards Mopley Pond but it's by no means certain what they contained. All traces of the PLUTO pipeline were removed during post war salvage operations, so no evidence now exists of its precise route. However, it's possible it followed the above route, since the earthenware pipes would have provided protection for the pipeline within. The pump-house was constructed of corrugated iron with a gabled tin roof and double doors in the end. To all intents and purposes it looked like a domestic garage. Its position near the pond suggests that the water was used to keep the pumping engine cool. The supply of fuel from the storage tanks to the nearby pump house may have been gravity fed, because there was a ten metre head between the pond and the tanks. All that is left today is the concrete base and even this is overgrown with vegetation. From Mopley to Stone Point on the Lepe foreshore is a straight run of 3.25 kilometres. The Pluto pipeline then ran underwater across the Solent to Thorness Bay on the Isle of Wight and thence across the Island to Shanklin Chine, where it crossed the Channel to the Cherbourg Peninsular. 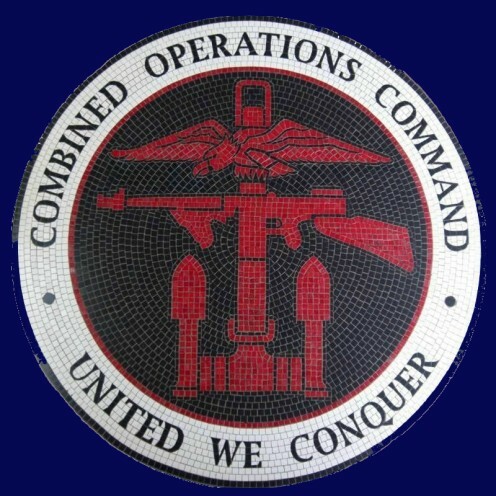 We're grateful to David Ride for providing the information on which this article is based. The text was approved by him prior to publication. Inevitably there's much informed guesswork and speculation in this article but it does provide a useful record of the existence of a long forgotten local wartime project. If anyone can add to our knowledge of this PLUTO installation, or any other similar installations, please get in touch using the 'contact us' link at the top of the page.